The “final four” who will battle it out for the title of World Jumping Champion have been decided after a thrilling day at the Alltech FEI World Equestrian Games. Much to the excitement of the host nation, Patrice Delaveau has made the cut, and will be joined by the USA’s Beezie Madden, Sweden’s Rolf-Goran Bengtsson and The Netherlands’ Jeroen Dubbeldam in the closing stages of what has been one of the most exciting world championships of all time. A total of 29 horse-and-rider combinations lined up, and French course designer, Frederic Cottier, presented two superb tracks that brought the cream to the very top. Only eight horse-and-rider combinations jumped clear over the 12-fence first-round track, in which the triple combination at fence eight, the massive oxer at fence 10, the following vertical at 11 and final oxer at 12 all played a significant role. There were three countries represented by three riders – Ireland, The Netherlands and France – as the day began, and the vociferous home supporters were devastated when Penelope Leprevost was eliminated for parting company with Flora di Mariposa at the open water at fence six. Lying in seventh place as the competition began, Leprevost was looking good until her mare landed in the water, stumbled and pitched her out of the saddle to bring her world championships to a close. But the 34-year-old rider still goes home with a team silver medal in her pocket after great performances earlier in the week. Delaveau and Orient Express followed with one of their typically heart-stopping rounds during which the stallion broke into a trot when checked between the open water and the following oxer and then survived a thrilling run through the triple combination. Denmark’s Soren Pedersen, lying third, plummeted down the leaderboard when leaving three fences on the floor with Tailormade Esperanza de Rebel but, second-last to go, Sweden’s Rolf-Goran Bengtsson produced a fabulous clear. Last in the first round, 2006 silver medalist Beezie Madden and Cortes C hit the oxer after the roll-back at fence five. But as leaders going into the day, that only brought their tally to 4.16 and left them well in the chase as round two got under way. The new course had just 10 fences, but the oxer at fence four and the triple-combination at nine weeded more of them out. Ireland’s teenage jumping sensation Bertram Allen once again took the world by surprise when finishing in seventh place, with team-mate Denis Lynch finishing ninth, and Darragh Kenny claimed 12th after having a fence down. 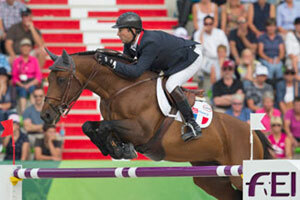 Allen, 19, rode with poise and balance on Molly Malone left many 20 of the highest-ranked show jumpers in his wake. Irish show jumping manager Robert Splaine said to get three riders into the top 12 in the world was a magnificent achievement, and “it was wonderful to see the reception we got from this packed stadium here today”. Four veterans of the sport go through to Sunday’s much anticipated finale, with three experienced super-star horses and Dubbeldam’s newcomer, Zenith SFN, who has proven his world-class ability this week. The Dutchman, who was Olympic champion in Sydney 2000 and a member of the gold medal winning Dutch team on Thursday, admitted he is somewhat surprised to find himself challenging for the individual world title on a horse that is comparatively green. No US or Dutch rider has ever won world championship individual gold. If Beezie Madden takes the 2014 title she will be only the second lady rider to do so in the 61-year history of the Jumping world championship; The last lady champion was Canada’s Gail Greenough who rode Mr T to gold at Aachen in 1986. Asked how they will prepare for the final test in which they will all ride each other’s horses and start on a zero score, Delaveau was first of the four to reply. “For me it’s a secret and it is my secret and I don’t reveal it to anyone!” he said with a laugh. Madden and Bengtsson said they will probably watch a few videos of their rivals’ horses but both agreed they know the oppositions’ rides very well. Standings after Jumping Semi-Final: 1, Orient Express HDC (Patrice Delaveau) FRA, 4.08; 2, Cortes C (Beezie Madden) USA, 4.16; 3, Casall ASK (Rolf-Goran Bengtsson) SWE, 4.34; 4, Zenith SFN (Jeroen Dubbeldam) NED, 6.25; 5, Rothchild (McLain Ward) USA, 6.56; 6, Cornet D’Amour (Daniel Deusser) GER, 8.70; 7, Molly Malone V (Bertram Allen) IRL, 9.00; 8, Vivant (Cassio Rivetti) UKR ,11.14; 9, All Star (Denis Lynch) IRL, 11.83; 10, Cornado NRW (Marcus Ehning) GER,12.14.